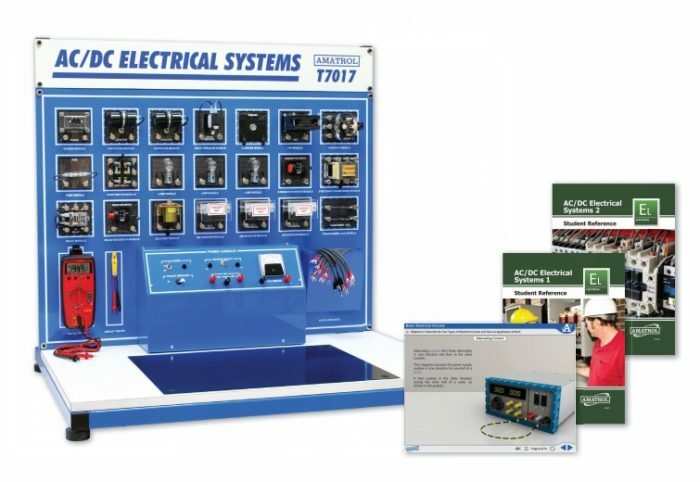 Amatrol’s AC/DC Electrical Learning Systems 1 and 2 (96-ADE1 and 96-ADE2) cover the fundamentals of electricity, such as electric measurement training and basic electrical circuit training, as well as inductance, capacitance, and transformers. Electricity is the most widely used utility and the demand will continue to increase as technology continues to grow. This means that more engineers and technicians will be needed to install, develop, and maintain electrical devices. These learning systems include a large array of industrial electrical power and control components, typical of what learners will find in real world applications. This hands-on experience is invaluable in today’s workplace. The industrial components included with these learning systems are used with the heavy-duty welded steel workstation included with the Basic Electrical Training System (96-ADE1). This workstation features instrumentation, component mounting surface, component storage panel, and a built-in analog voltmeter. Each component’s leads are attached to quick-turn terminal posts, allowing learners to quickly connect components for a variety of circuit applications. Each learning system also includes an in-depth online electrical training course. This Electrical training system covers the basic concepts of electricity, electrical measurements, and circuit analysis. This system includes various industrial quality components including a lamp module assembly, knife switch assembly, solenoid module assembly, fuse module assembly, circuit breaker module assembly, and much more! This system also includes a heavy-duty workstation with built-in power supply that allows learners to easily connect components and build hands-on skills. The next Electrical training system (96-ADE2) adds onto the first system to expand a learner’s basic electrical skills including topics like inductance, capacitance, combination circuits, and transformers. This system includes a capacitor module assembly, relay module assembly, rheostat module assembly, and other industrial components. Learners will practice skills like testing a capacitor with a DMM, tracing the current path in a combination circuit, and calculating the current load on a transformer. These electrical systems feature an expansive offering of electrical knowledge. Learners begin by studying very basic electrical topics such as defining electricity, describing alternating and direct electrical currents, and describing the operation of manual switches. Learners then move on to more advanced topics like voltage/current measurement, circuit protection devices, inductor and capacitor applications, voltage dividers, and transformer types. The online training courses are presented as interactive multimedia which includes audio, cutting-edge 3D animations and illustrations, and video. Virtual simulations of electrical applications engage learners on a higher level by providing additional circuits and conditions under which learners can study. Learners can use the software to create and simulate circuits of their own design in addition to the circuits described by the exercises in the student learning materials. Sample copies of the AC/DC Electrical 1 and AC/DC Electrical 2 Student Reference Guides are also included with the systems for your evaluation. Sourced from the multimedia curriculum, the Student Reference Guides take the entire series’ technical content contained in the learning objectives and combines them into one perfect-bound book. Student Reference Guides supplement this course by providing a condensed, inexpensive reference tool that learners will find invaluable once they finish their training making it the perfect course takeaway.